10 December 2015, Phuket – The International Dinghy Classes Race 2015 sponsored by PTT Group, a part of the 29th Phuket King’s Cup Regatta, wrapped up after four days of racing on Thursday, a lay-day for keelboats and multihulls, as young sailors try to seal Regatta victory in honor of His Majesty the King of Thailand. The growing number of fleet entries from 45 last year to 78 dinghies this year shows the rising enthusiasm for sailing in Thailand. Optimist sailors and Laser sailors were in competition in decent winds and beautiful sunshine. They were led by Optimist Girl sailor Chanokchon Wangsuk, who claims overall victory in Optimist; a brilliant performance out of 56 Optimist sailors and testament to the rising quality of junior sailing among Thais, and driven partly by the strong support of sponsor PTT Group. Saranwong Poonpat won the Optimist Boys. From the Laser and Topper classes, Keerati Bualong won the Laser Standard, Laser 4.7 champion was Chaichanawut Deenak, and Topper champion was Navee Thamsoontorn. 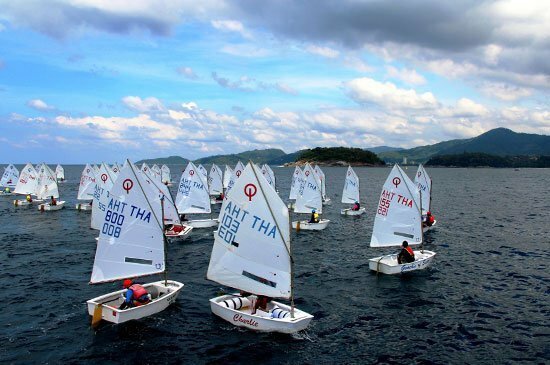 The International Dinghy Class was introduced as part of the Phuket King’s Cup Regatta, creating a network between sailing clubs to inspire more youths in Thailand to take up the sport, especially the Optimist challenge for the under 15 years. The establishing of the International Dinghy Series has helped bring to the fore many young Thai sailing talents, with more and more sailors joining every year. The program sponsored by PTT Group serves as an accessible means of competition for young sailors from many sailing clubs in Thailand, including Phuket, Pattaya, Phang Nga and Songkhla in order to prepare them for the international competition, and for the Phuket King’s Cup Regatta. The program is also in line with PTT’s mission to continually strive towards clean energy, zero emissions, for a sustainable energy future. Sponsors of the Phuket King’s Cup Regatta include Principal Host Sponsor Kata Group, and Strategic Partners: The Government Lottery Office (GLO), Thailand Convention and Exhibition Bureau (TCEB), and Tourism Authority of Thailand (TAT). Co-Sponsors: Central Pattana, PTT PLC, Siam Winery & Montclair and Haadthip PCL. Media Partners includes Phuket Gazette, PGTV, Prestige, SailWorld.com, Yachtstyle, Sea Yachting, Phuket Magazine, Image Asia, RL Magazine, The Guide Phuket, Phuket Marine Guide, and Art & Culture. Contact information: Phuket King’s Cup Regatta Office T/F: +66 (0) 7627 3380. General inquiries: info@kingscup.com. Racing inquiries: racing@kingscup.com Entry is now open to competing sailors.